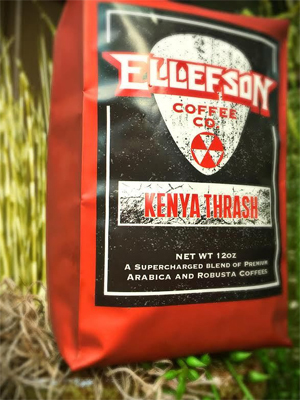 Ellefson Coffee Co, the premium coffee brand of java connoisseur, Author, and Rock Star David EllefsonMEGADETH, has officially unleashed it’s second blend KENYA THRASH. Packaged in a distinctive red metallic bag, Kenya Thrash is a bold high-octane blend of 90% Kenya-Kichwa Arabica Beans, and 10% India Robusta, roasted with a kick, for a high blend of flavor and function. An “Earthy and Savory” blend, with distinct notes of Grapefruit and Black Pepper, Kenya Thrash is a guaranteed wake up call to body, mind, AND tastebuds. “Thrash” is the follow-up to ROAST IN PEACE, the highly celebrated original Dark Roast Blend, small-batch roasted from 100% Brazilian Arabica, with distinctive notes of “Chocalate, Dark Caramel, and Roasted Nuts”, already receiving high praise from coffee lovers and media alike. With features like a segment with Ellefson on ANTHRAX drummer Charlie Benante’s Coffee podcast, and a feature in the July issue of REVOLVER MAGAZINE, and high profile artists like HELLYEAH, SEVENDUST and LAMB OF GOD publicly singing it’s praises, Roast In Peace has already become a staple in the mugs of the Rock N’ Roll elite.